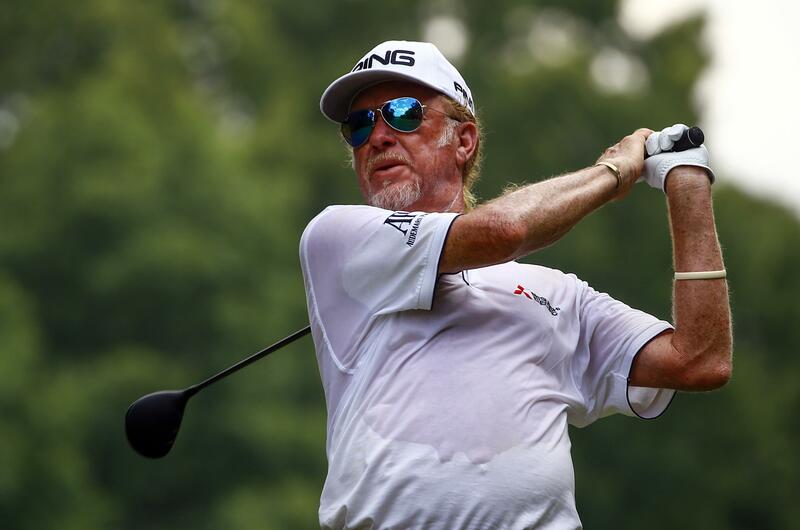 Sat., July 28, 2018, 8:14 p.m.
ST. ANDREWS, Scotland – Miguel Angel Jimenez shot par 72 in blustery conditions to remain 9-under overall and two shots clear heading to the final round of the Senior British Open on Saturday. Tied for second were Tom Pernice (71), Moses Lake native Kirk Triplett (73), defending champion Bernhard Langer (73) and Stephen Ames (74). Jimenez’s four birdies neatly canceled out his four dropped shots. He made the unlikeliest of birdies at the long 14th when his blind approach from thick rough somehow bounced and rolled its way to no more than a foot from the cup. A neat up-and-down from the Road Hole bunker left of the 17th green kept things going. But a 10-foot putt for birdie on the final green slid past. It was, he felt, a day for patience. Watson won the British Open five times, but not at St. Andrews, and remains hopeful of annexing this seniors title for a record-breaking fourth time. “It’s good to be in position,” he said. Published: July 28, 2018, 8:14 p.m.